The research groups in London (my old colleagues from Guy’s and St. Thomas’) and in Cambridge collected a large set of MRSA isolates from hospital inpatients, outpatients, and GPs. For the London study, this was 610 patients over four months, and for the Cambridge study, 1465 patients over 12 months. All of the MRSA isolates were whole genome sequenced and transmission clusters identified. In the London study, 41% of the 610 patients were linked in 90 transmission-clusters, of which 27 spanned multiple hospitals (see Figure 1). Confining the analysis to each single hospital setting would miss at least one third of the transmission clusters. Almost all transmission was linked to hospital wards and not outpatient or community settings. 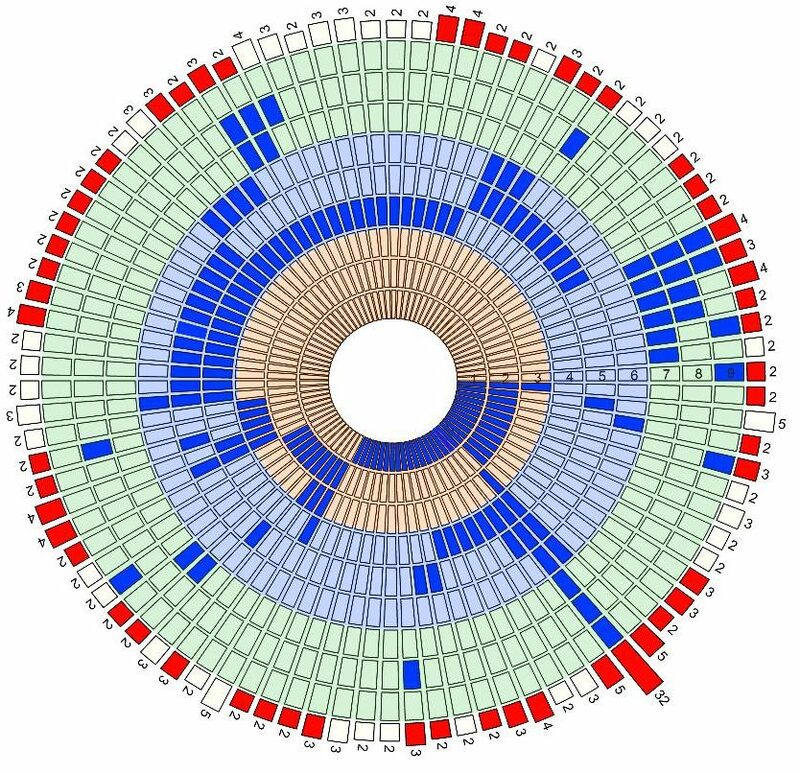 Most clusters were small (95% included 2 or 3 patients only) but one 32 patient cluster (of ST22 EMRSA-15) was identified. Within this cluster, only 9 / 32 cases were epidemiologically linked in each single hospital; however, 26 / 32 patients had multiple contacts with one another during ward stays at any hospital. Amazingly, ST22 MRSA from different hospitals were more clonally related than ST22 MRSA from individual hospitals, suggesting that MRSA transmission occurring as a result of patient sharing between hospitals is an important driver of transmission. Figure 1: The nine concentric circles represent healthcare settings (i.e. inpatient; outpatient; community) for hospitals A (orange), B (blue) and C (green). The 90 transmission clusters are represented by a segment. The number of unique patients in the cluster is shown by a bar. Red and white bars correspond to transmission clusters of ST22 and other STs, respectively. For each cluster, the location of patients in the cluster at the time of sampling is shown in blue. We concluded that the explanation for these findings is as follows: once MRSA patients are identified at a particular hospital, that information is recorded on paper / electronic notes enabling immediate implementation of MRSA care pathways locally (contact precautions, isolation and decolonisation) for subsequent admissions. However, if this patient is admitted to another hospital and the information of MRSA patient status is not shared, the risk of direct (patient-to-patient) or indirect transmission would be greater in the second hospital because they would not implement MRSA control measures immediately (e.g. contact precautions, isolation and decolonisation). The findings of the Cambridge study were very similar: 41% (yes, not a copy and paste error!) of the 1495 individuals were linked in 173 transmission clusters. The majority of these clusters were related to hospital wards, but unlike the London study, 27 of these clusters included community contacts alone, which suggests some community transmission of MRSA. There are some important differences between the studies that could explain this difference: geographical location, WGS methodology (the London study defined a cluster as ≤10 SNPs, whereas the Cambridge study defined as cluster as ≤50 SNPs), and patient inclusion / exclusion criteria. The importance of these findings goes beyond MRSA to all antibiotic-resistant organisms, especially the threat of CPE. I posted recently about a study all about the importance of regional referral networks and the spread of CPE, concluding that small problems within your referral network are more of a risk than larger problems outside your referral network. Effective sharing of patient colonisation status is a simple (in theory!) was of mitigating this risk. Exactly how to do this? Answers on a postcard!